ArtsEmerson, Boston’s leading presenter of contemporary world theatre, proudly welcomes Dead Centre’s (Ireland) Hamnet, co-directed and co-written by Bush Moukarzel and Ben Kidd. Hamnet opens September 20 and runs through October 7. A multimedia theatre experience, Hamnet brings Shakespeare’s only son, who died at age 11 without knowing his famous father, to the stage. A riveting performance carried chiefly by a solo young actor confronts what it means—and what it costs— to be great. ArtsEmerson and Dead Centre will provide Boston audiences a final chance to see Ollie West perform in the role of 11 year old Hamnet who The Guardian calls “riveting [and] completely poised”. The companies celebrate West’s farewell performance as well as welcoming the young and talented Aran Murphy to take over the role of Hamnet in the final week of performances at the Emerson Paramount Center. Shakespeare’s only son takes center stage. 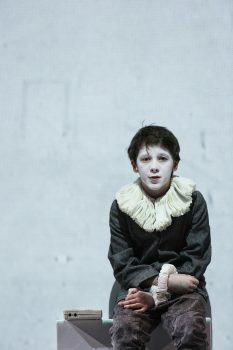 William Shakespeare had one son: Hamnet. While William was away working in London, Hamnet died at 11 years old without ever knowing his famous father. How do our dreams impact our families? Do adults really have it all figured out? Or are we blind to what we could have done better until it’s too late? In Hamnet, a tour-de-force performance from a young actor confronts what it means—and what it costs—to be great, and how living in the shadow of that greatness can keep one in the dark. In this moving, meticulous, multimedia wonder, ambition clashes with family responsibilities in a way that rivals the stakes of a great Shakespearean tragedy. Running time: 60 minutes. The production runs three weeks at the Emerson Paramount Center’s Robert J. Orchard Stage, located at 559 Washington Street in downtown Boston. www.ArtsEmerson.org, by phone at 617.824.8400, or in person at the box office.